Pin me! Thank you so much!! This was one of my most favorite parties I’ve thrown to date! 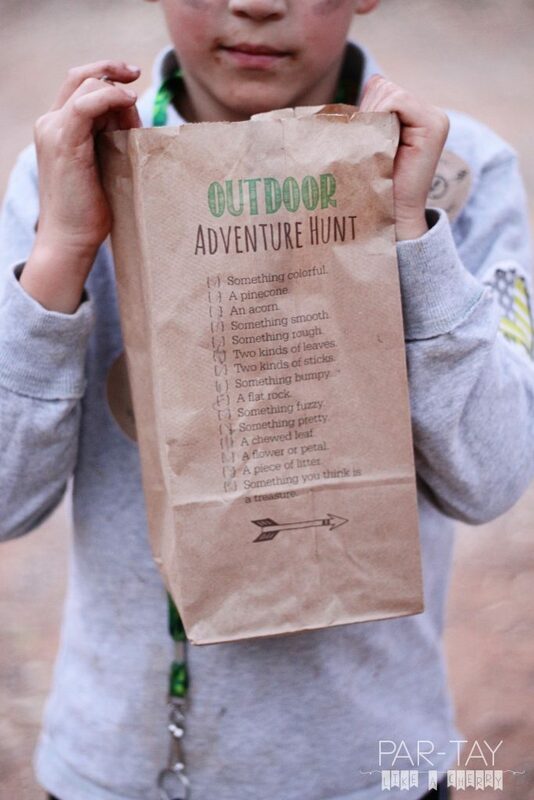 I am so excited to finally share all the details from my son’s Camping party adventure with you all! 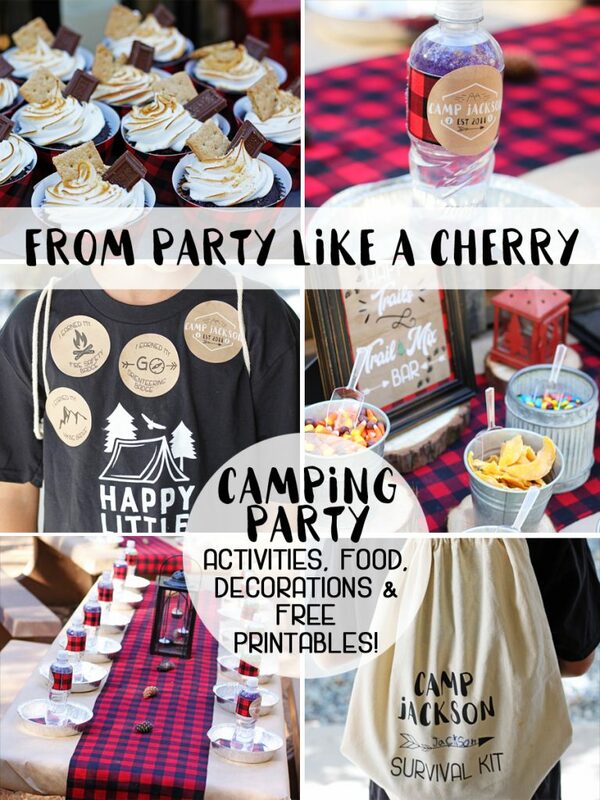 I have Camping party food, activities, decorations and of course- FREE PRINTABLES BABY! So keep reading, you don’t want to miss this! I always like to have a “welcome activity”. I.E. something the kids can do to keep them occupied as we are waiting for all the guests to arrive. 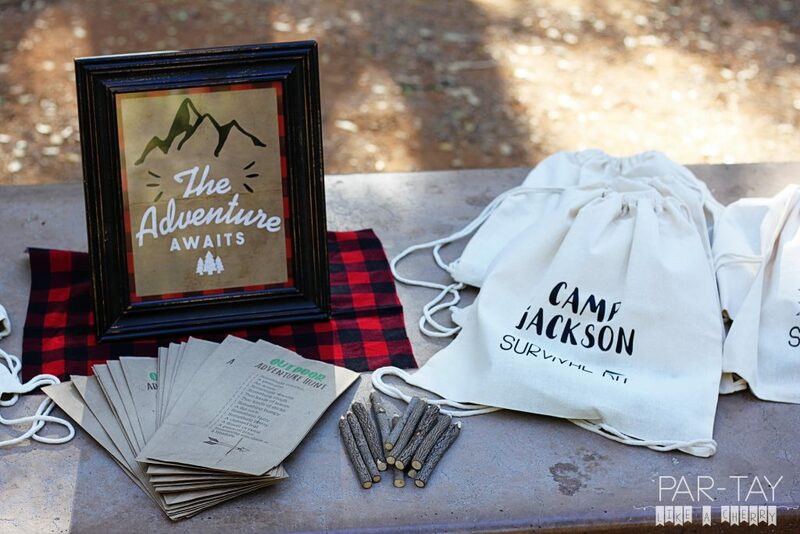 As their party favor I put together Survival Kits (with the help of the wonderfully talented Sweet Lane Events). So decorating these canvas totes was our welcome activity. 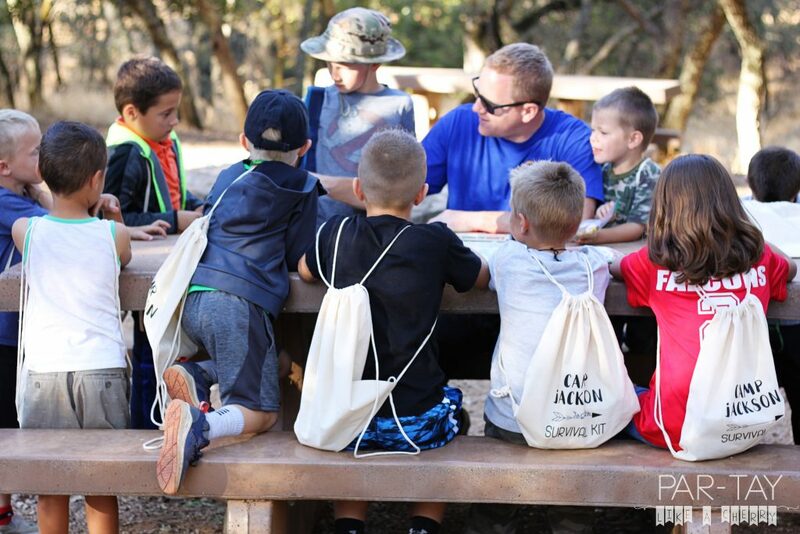 Most of the kids were just exploring the campground but a few of them did sit down and used the fabric markers to personalize their bags. 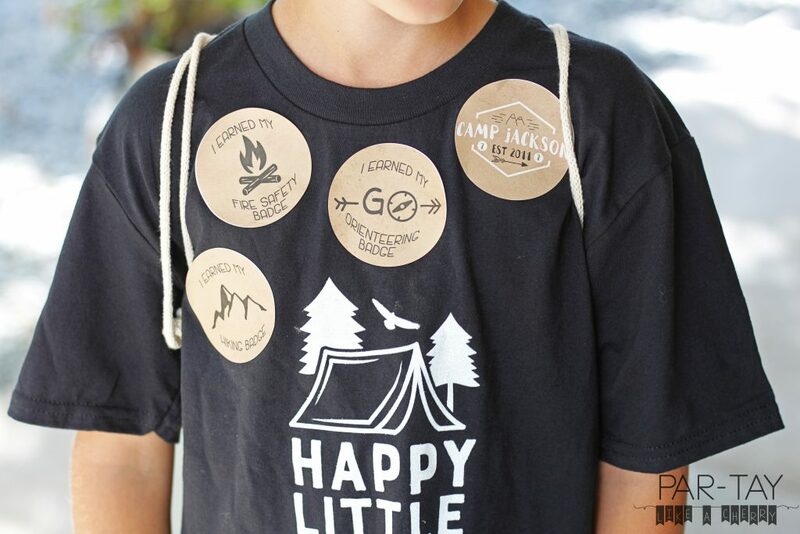 So I had this brilliant (OK, I thought it was brilliant) idea to have the kids earn badges while at “Camp Jackson”. So the activities all centered around the badges they earned. First was their Orienteering badge! I put my husband in charge of this (holla!). I had ordered compasses for each of the kids (which were pretty crappy by the way but apparently you cant get a real compass for like less than $10-$15). My husband did a quick 101 on N,S,E,W and how to tell which way you were going with the compass. Then he put out several cones and gave them directions (go the the NW cone, go to the NE cone) etc. Once they completed this “lesson” they got their first badge! Hard at work in their Orienteering Lesson! Next up- it was time to earn the hiking badge! 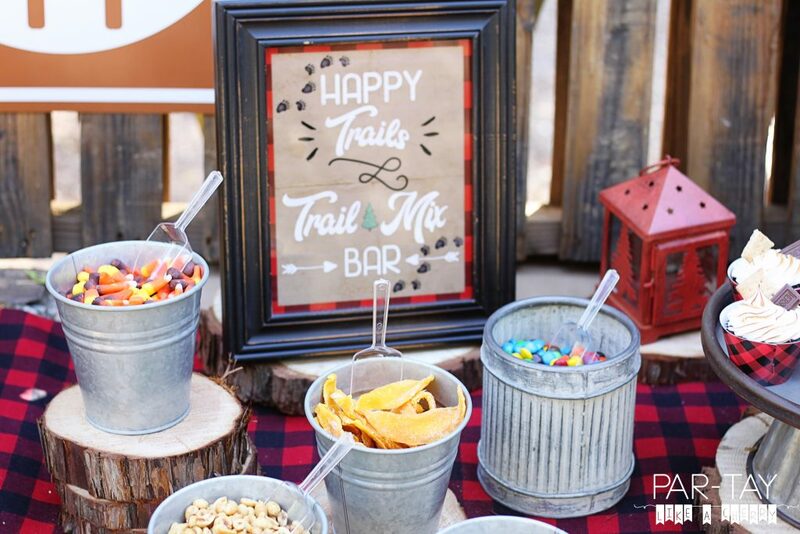 But not before they loaded up at the Trail Mix station! 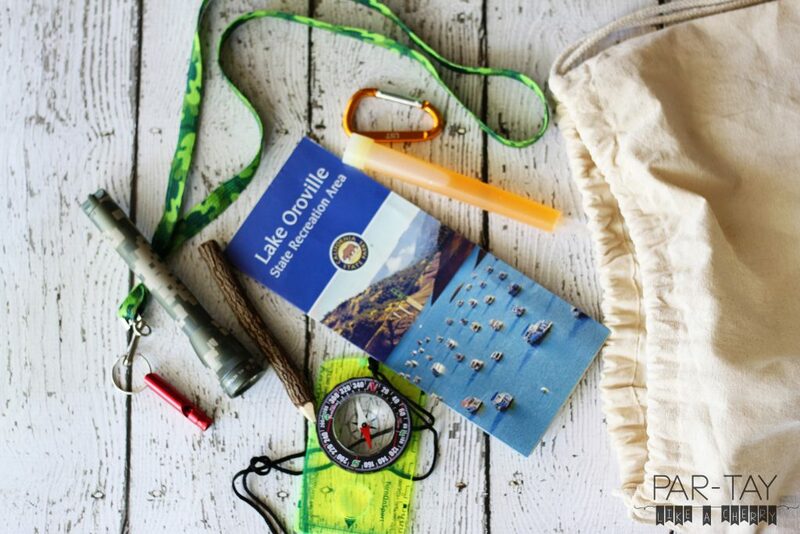 Hey- who knows what could happen on a mile hike. You have to be prepared! 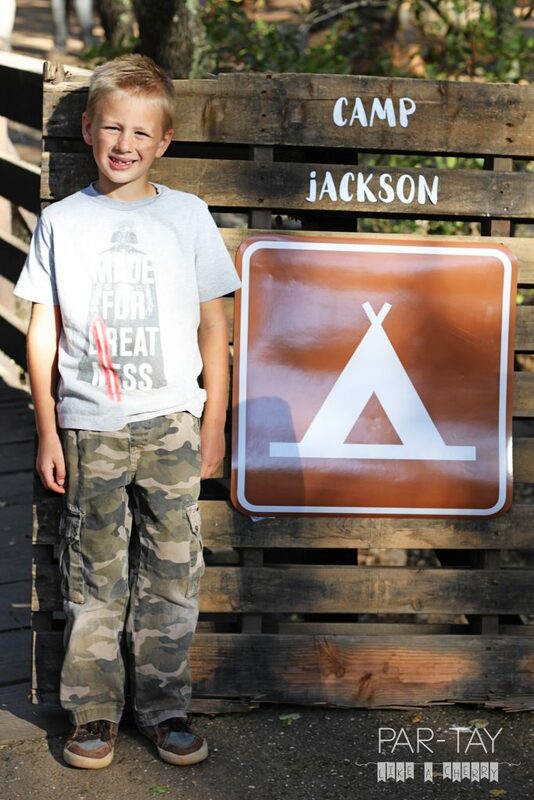 My husband and one of the other parents took the kids on about a mile hike on a trial that went around the campground. Along the way they talked about hiking safety, blew the heck out of their survival whistles, and learned a little bit about the local plant and animal life. (It also gave me time to get the fire going and prep the food for when they got back!). These Dad’s win an award for this! Last up was the Fire Safety Badge! Once again my husband took charge of this (I should really plan more parties where he has to entertain the kiddos the whole time!) and taught the kids some basic Fire Safety and Fire Starting. That was a nice intro into dinner- where they had to practice their fire safety as they roasted their hot dogs. Now that’s a camper’s face! Dinner was what you would expect- roasting hot dogs over the fire, watermelon, potato chips, and propel to drink. Unbelievably I didn’t get a single picture of all those cuties roasting their hot dogs (I think I was too busy trying to make sure none of them fell in the fire or something) or any of the dinner! I am actually having serious regret/remorse right now about how terribly I captured this party. One day I’ll have to spring for a photographer to come! 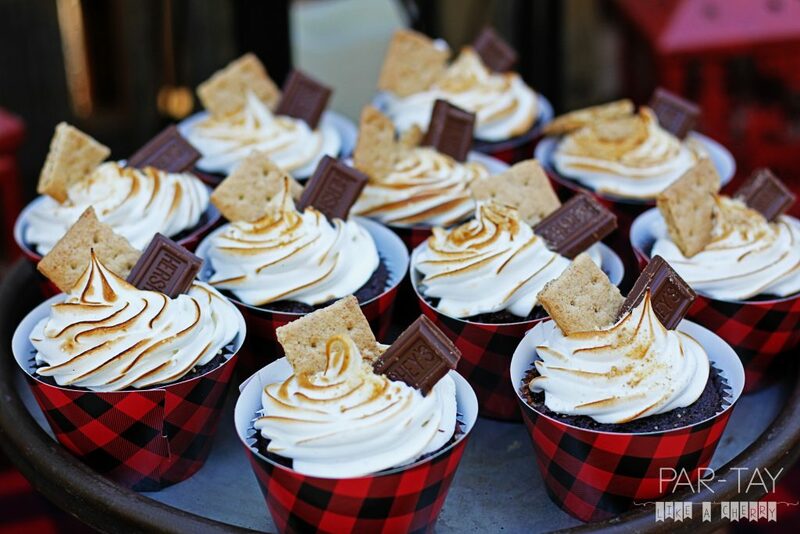 For dessert we had the most delectable s’mores cupcakes that my Mother-in-Law made along with actual s’mores. Those kids totally let me down with their sugar consumption too, I mean I was practically shoving it down their throats! Hopefully they’ll do a little prep next time and come more prepared to consume their body weight in sugar when attending a Cherry party. I believe she combined a few different recipes to make these including this one. 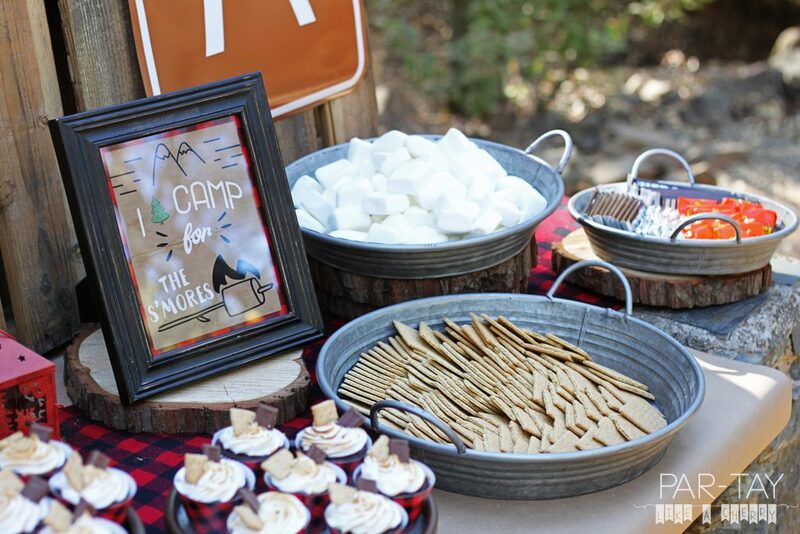 And you can’t have a camping party without a S’mores Bar! I got peanut butter cups and peppermint patties for those who wanted to spice up their s’more (dang it I was too busy hosting to eat 10 of them!). 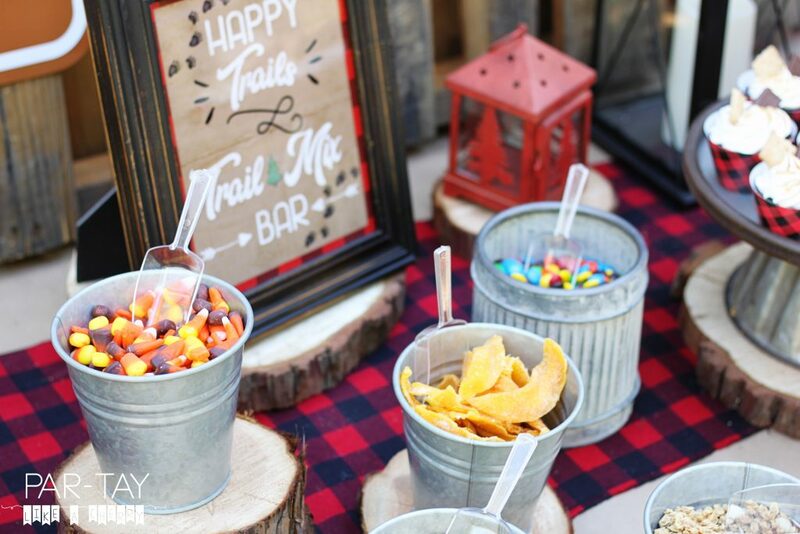 And lastly on our dessert table we had our Trail Mix Bar. I didn’t anticipate how eagerly they would fill their trail mix bags for their hike, and subsequently not want much to do with dinner and dessert- whoops! But the look on their little faces as they filled up their bags was hilarious. I just put out ziplock sandwich bags and let them go to town. We had: dried mangoes, candy corn, peanuts, granola, m&ms, pretzels, and chocolate covered pretzels (the birthday boy’s favorite). 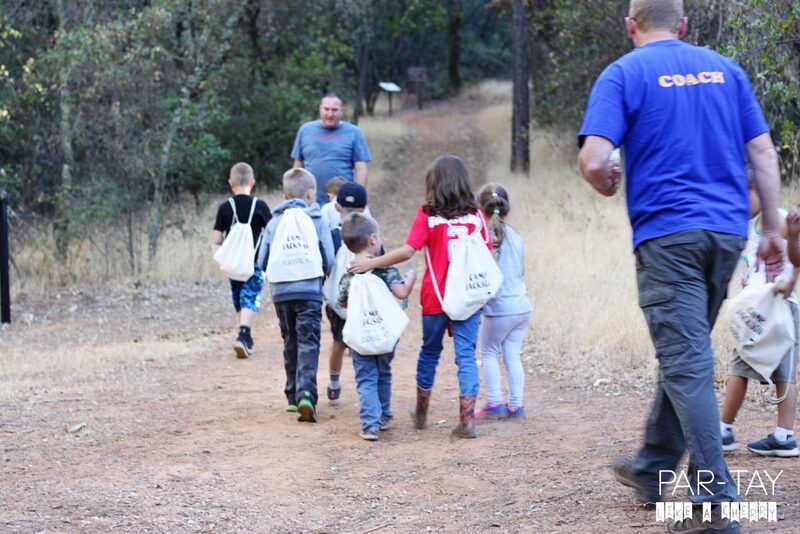 They then put their trail mix in their survival kit bag and headed out on the hike. 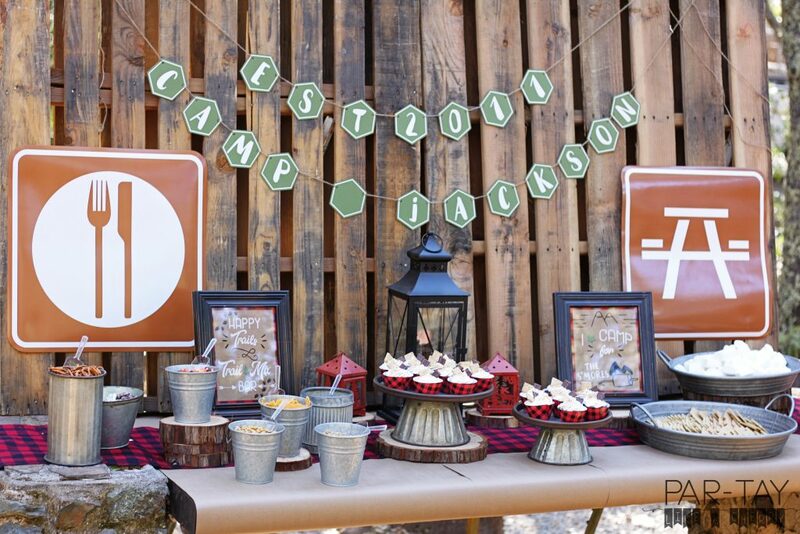 We held the party at a campground, so that took a lot of the work out of the decorations! Our natural surroundings set the mood pretty dang well. I just covered all the tables with kraft paper (you need almost a whole roll per table!) 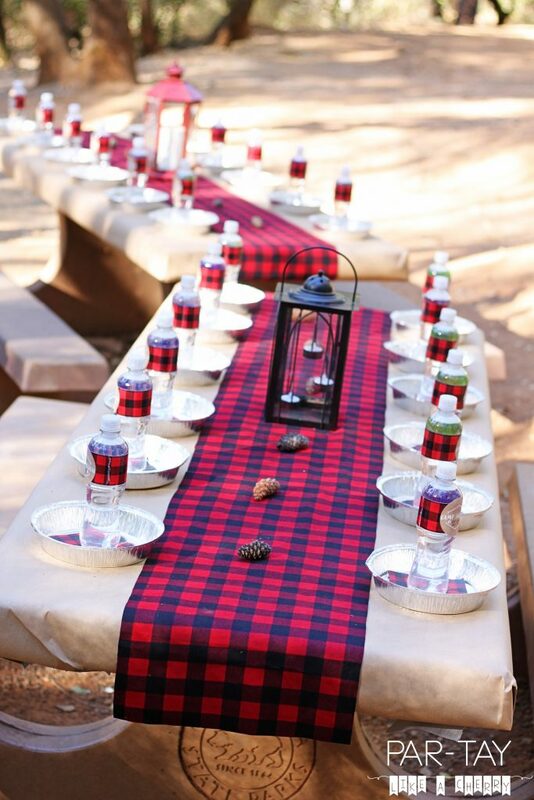 and got some buffalo plaid fabric from Joannes that I cut for table runners. I tried and tried to find something suitable on amazon or Oriental Trading but they all looked plasticy, and I wanted more cozy…so I went for actual fabric and just used them as table runners since covering the whole table would have been $$$. You need like the heavy duty duct tape to get the kraft paper to stick to the picnic tables (I taped it underneath). I stuck a lantern in the center for the centerpiece and had the kids gather pinecones for me to sprinkle around. For the place settings I used disposable tin pie plates in lieu of plates. 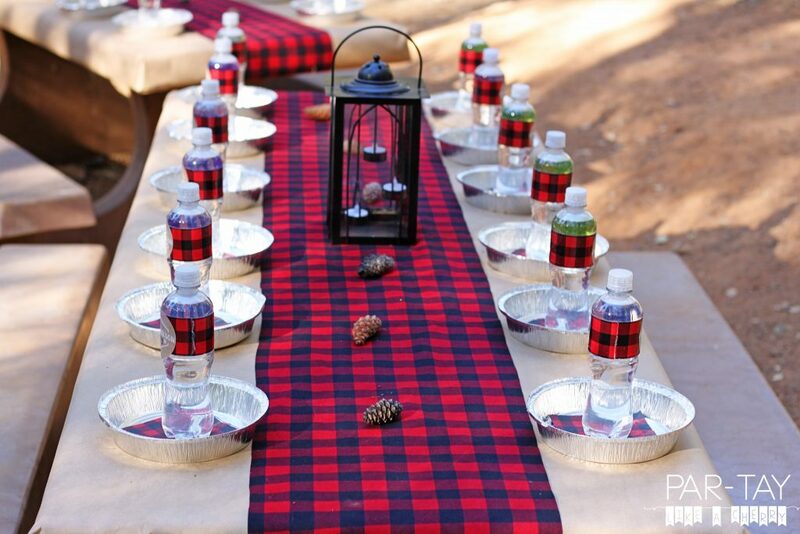 We had buffalo plaid napkins (which actually proved kinda hard to find) and propel (the birthday boy’s favorite drink). 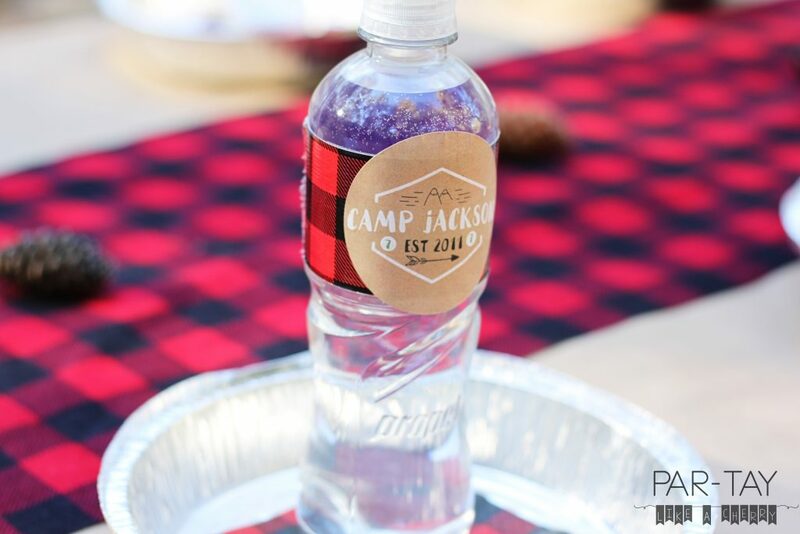 Believe it or not I found buffalo plaid duct tape at WalMart and I used that to cover the propel label and stuck a Camp Jackson sticker on it. I can personalize stickers like this for your event for $5. Just email me partylikeacherry@gmail.com with the child’s name, age, and birth year. You will receive a digital file that you can print on these sticker labels. (payaple via paypal or venmo). I was so excited with how the dessert table turned out. I asked my hubby to bring home some pallets from work. “You know, not to new, not too old, not too banged up, more of a darker color not the fresh light wood ones…” His eyes kinda glazed over. But he totally nailed it! We used some stakes to prop them up in the back. See? Didn’t he nail the pallet selection? The banner is from my friend over at Sweet Lane Events, I love how it tied everything together! She was such a joy to work with too and so patient, sending me several proofs and options and mailing it all put together with twine and everything! Such a life saver. Make sure you check out her site for your party needs! The wood rounds were also compliments of my hubby. I picked out some logs from our wood pile and he cut them for me. I also added some lanterns and everything galvanized I could scrounge up! (The little galvanized buckets I found at Wal Mart! The rest is from my Mother in Law, she has quite a collection!). In the end I had an extra pallet left and some extra vinyl from Sweet Lane Events so I made this little entrance sign at the opening of the campground. These awesome campground signs I just got from Amazon. I was shocked at how huge they were! They are just a thick cardboard but they worked out perfectly. 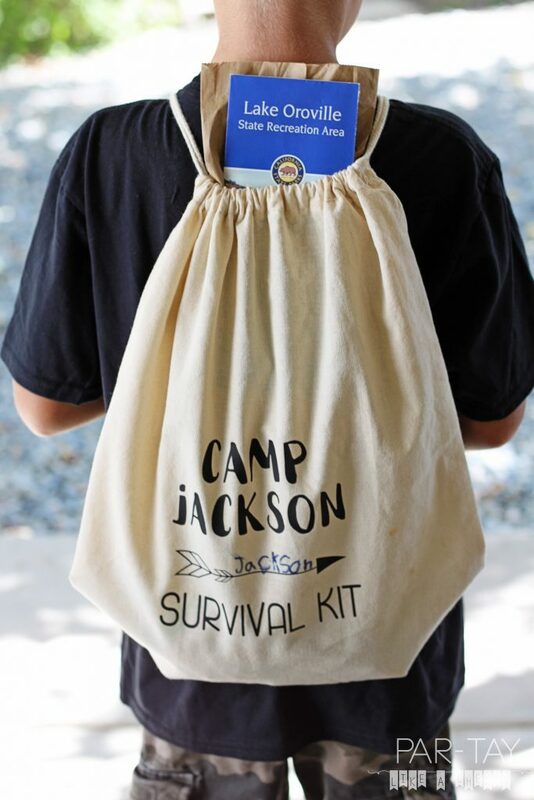 The survival kits were their party favors of sort. We packed those suckers with: a camo lanyard, a survival whistle, a survival glow stick, a compass, a camp of the campground/surrounding area (I got from the ranger on duty), a carabeener, and a flashlight (I got ours at Harbor Freight). Did I mention that Sweet Lane Events added the vinyl to these canvas bags I got from Amazon? I love how they turned out! This is not an exhaustive list of everything I bought for the party… but this is most everything! I hope it helps make planning your party easy and seamless. And yes, I do get a small (very small) kickback from Amazon purchases, so thank you SO much for supporting my site. Personalized banner from Sweet Lane Events! Roasting Sticks <— these came in super handy with the kids. Twig pencils <— these were a huge hit! And of course I wouldn’t have a party post up without free printables! Most everything I can alter or personalize for you for a $5-10 fee (just email me at partylikeacherry@gmail.com if interested). Scroll to the bottom for the Google Drive link to download these free printables! Free 8X10 printable. I put this at the table with all of the Survival Kits. 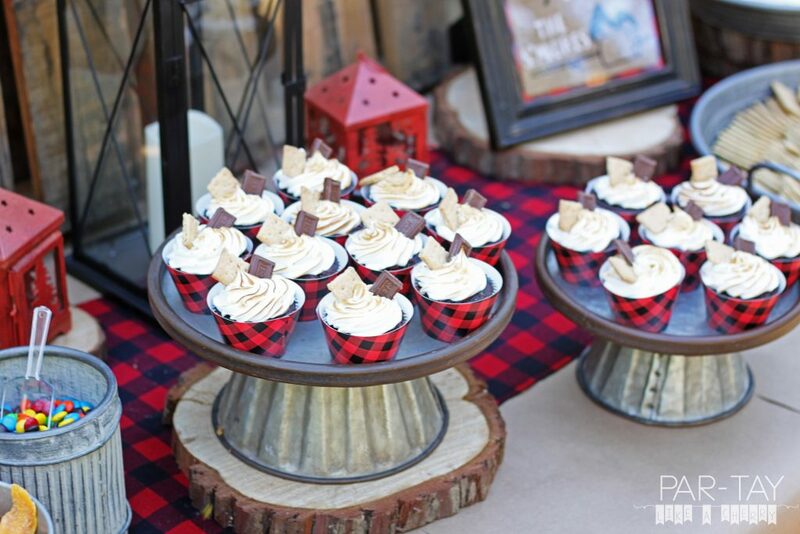 Put this by the S’mores Bar of course! If you missed my post on the invitation, you can check out that free printable here.